Expert advice to improve your personal best. The 5K is a special event—at only 3.1 miles, it's short enough to run fast if you're in good shape. But many runners think because the race is short, you don't have to train well for it. That's a mistake. In reality, a 5K is a very short distance. Most of us can cover 3.1 miles in 30 minutes or less. If you're a little slower, that means you'll improve even faster if you train smart. You can run a series of workouts that will help you build endurance, fine-tune speed, and run a new personal best. They're not easy, but they work. These workouts will help you build three different types of running fitness: speed, endurance and race-specific fitness. Striking a balance among these skills will help you feel powerful on race day. So if you're curious about how to structure your 5K training better, here are three types of workouts to include in your program. Children love to sprint. As we get older, though, we lose our ability to sprint. While there are many ways to working on your speed and turnover, running strides at least twice per week provides the simplest strategy that works best for most runners. Strides are simply accelerations about 100 meters long (or the straight section of an outdoor track). Start running, build to about 95 to 98 percent of your maximum speed, hold for two to three seconds, and then slow to a complete stop. One stride should take about 20 to 25 seconds. Run strides after your easy runs in your street, front yard or on the sidewalk. After each one, take about a minute of walking or standing (don't run in between) to recover. Strides help you develop a more efficient running form, improve coordination at higher speeds, and reinforce a quicker turnover. Every distance race—even short ones like the 5K—requires endurance. When I get questions from runners about endurance, my answer is always to complete a consistent weekly long run. 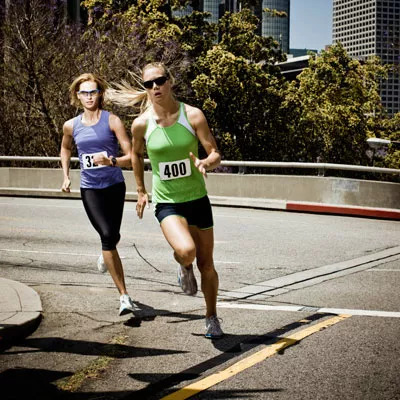 For the 5K, there's no reason to run 20 miles like you would during marathon training. Instead, a long run in the 8- to 12-mile range will work very well. If you're super competitive, you may want to run a little longer. After four to six weeks of completing long runs consistently, you'll dramatically improve your fitness, and the 5K distance won't seem as long (because it's not!). Finally, you'll be able to focus on running faster rather than just finishing or running the same pace that you always do. Here's the fun part: Race-specific workouts combine general endurance with speed, and closely mimic what you'll experience on race day. These workouts focus on the specific fitness you need to run your 5K goal pace. If your goal pace is 8:30 per mile, then your goal is to hold that pace for 3.1 miles on race day. Your training plan should focus on gradually getting you to a point where this is possible. You may start with a workout like 4 x 800 meters at your 5K goal pace and two minutes of easy running in between. This workout includes two miles at goal pace with sufficient recovery. More advanced runners may progress to a workout like 3 x mile at 5K goal pace and only 90 seconds of easy running as recovery. This workout is longer and has less rest so it's much more difficult—but it's also more specific to the 5K itself. This strategy of blending speed with endurance to build your race-specific fitness can help you run your fastest 5K yet. Train hard and race smart.